This is a fantastic 4 day adventure of discovery. 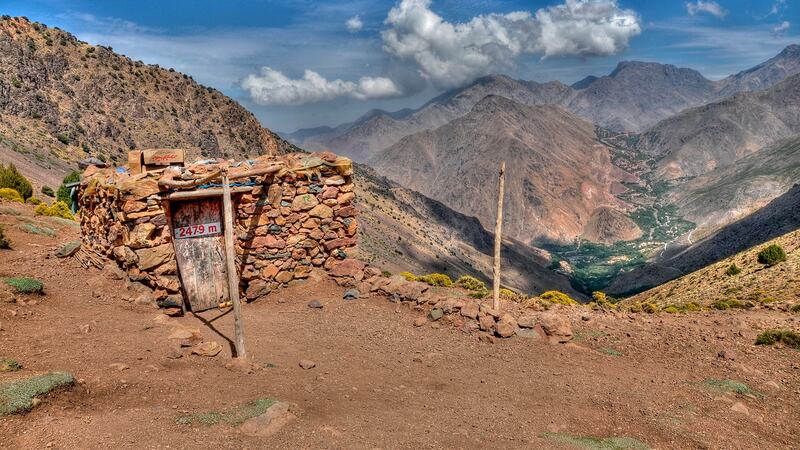 You will be immersed in the landscape, surrounded by the impressive peaks of the High Atlas. At your feet the fertile river valleys where remote villages of adobe and stone houses are home to the indigenous Berber people. This wonderful trek as it takes in four valleys and two national parks, each one showing a different face of this region. As with quite a number of our treks, the route can be done in reverse with the last night in Ouirgane; or you can be collected from there and driven back to Marrakech. We start our 4 day trek from the green valley of Ouirgane and hike up to the village of Tinzert, after a picnic lunch we continue to Tagadert Ait Ali on the other side of the mountains in Imlil Valley. We spend the night in a local homestay. From Tagadert Ait Ali we head northward across the Imlil Valley and ascend to Tizi el Bour. We descend then to the Imenane Valley and have lunch in Imska by the river. Rested and well fed we ascend again up through rocky paths and juniper trees to the Berber villages of Tinoughar, Tidli and finally to Agadir where you will spend the first night in a family run gite. This is an impressive place to start your day, the views down the valley from this location are outstanding, with terraced fields of barley and corn, fruit trees and vegetables, every accessible part of the mountainsides has been cultivated to feed this remote group of villages. The rich earth contrasts with the lush greens, and the surrounding mountains. We continue our trek up to the village of Gliz and from there, over the pass of Tizi n´Taratine 2200m. After a well needed lunch break; we trek down to the Imenane Valley and the village of Tinerhourhine for the nights’ accommodation. You will have seen your zigzag route for this morning as you descended to the valley yesterday. It is a slow climb up the 300 meters to the pass of Tizi n´Tamatert, but the views make it worth the effort, plus the option to have freshly squeezed orange juice at the pass. We trek down through the trees and have lunch in a shady spot before the final descent to Imlil.